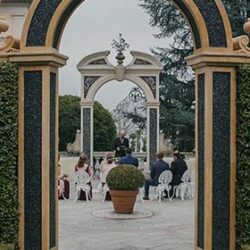 Together with Villa Claudia Dal Pozzo and Villa Giulia, Villa San Remigio is today one of the best destination to celebrate a civil wedding on lake Maggiore. Villa San Remigio is located on the top of Colle della Castagnola, near Verbania Pallanza and overlooks Lake Maggiore. Its garden was studied and realized from a young couple of lovers. It has a romantic and interesting story. Musician and poet Marquis Silvio della Valle di Casanova and passionate painter Sophie Browne, after their wedding in 1896 decided to realize their dream, transforming into a villa an old grandparents’ chalet. They renewed the park that became their lover refuge. 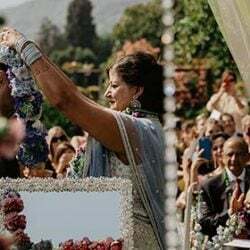 After more than 100 years Sophie and Silvio’s dream this wonderful villa is now on the disposal of bridegrooms who want to crown their big day. Just a touch of continuity and good fortune. An informal part, a garden and a wood with Mediterranean plants compose the park. They are all inspired by romantic mood of young lovers. Thirty gardeners worked to build the park during 1910 and 1916 to model the hill, obtaining a great result! Sophie and Silvio completed their eight hectares garden in 1916 end right after that they opened it to visitors. They were opened to fixed hours and the entrance was given as charity. Public opening lasted in 1929. Villa San Remigio has an articulated structure. You can have access to the central body from both entrances through internal stairs. One of the most important rooms is La Sala della Musica (Music Room) with a big piano where usually are held civil celebrations. Surrounding main room you will find the gothic little room and the humanistic study. Antique furniture is stunning and precious: doors, frames, fireplaces, and wooden ceilings. Its Lombardy Baroque façade has beautiful and huge artworks. At Villa San Remigio sides you will find a balcony from where you will appreciate an amazing view on the Lake. Under the balcony there is a rock gallery used also as Winter garden. This is for sure on the most stunning and evocative part of the entire garden, used also for wonderful wedding photos. This villa is now owned by Regione Piemonte and it is of Verbano-Cusio-Ossola Province headquarter. During spring and summer weekends gardens are opened to visitors with a single entrance at 10.00 am for a total guided tour of 2 hours. In order to celebrate a civil bending in the villa you have to book previously. In this case park and rooms will be on disposal and Mayor of Verbania will be the officer of the celebration. For any information about wedding at Villa San Remigio please CONTACT ME. 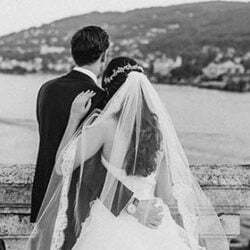 VALENTINA is our wedding planner and coordinator for Lake Maggiore. 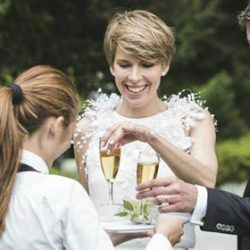 She has a long time experience in events planning on amazing Borromeo Islands, Pallanza, Stresa and Baveno. 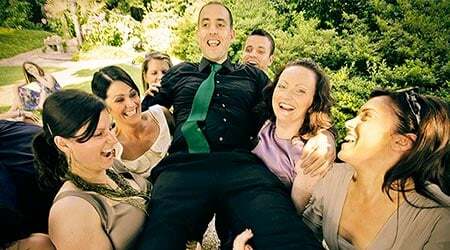 Valentina will be pleased to help you to arrange an unforgettable wedding day over Lake Maggiore!